Our Vineyard Retreat cottage is situated on 25 acres of private land which includes pasture, vegetable and flower gardens, an olive grove, hop garden and boutique vineyard with its own cellar Door. It is the perfect base from which to explore the beautiful Abel Tasman National Park offering boat trips, kayaking, walking or a combination of all 3! Or you could just laze on the stunning beaches of Kaiteriteri and Marahau which are all just 10 minutes away by car. The cycle trails are an exciting way to see the area, with the vineyard cottage only 1km away from the trail giving access to the Kaiteriteri Mountain Bike Park. Takaka and the beautiful Golden Bay is only 1 hour drive away. Have a day out 'over the hill' in Hobbit land. Visit the limestone caves on the way! The Riwaka Resurgence is where the northern branch of the Riwaka River emerges from the depths of the Takaka Hill and is just 7km away. Venture 15 minutes drive into Motueka to discover great cafes and restaurants, movie theatres and local artists and fresh produce the Motueka region is reknowned for. 40 minutes further on is the city of Nelson, offering many attractions including the WoW (World of Wearable Arts) Museum, boutique shopping, great cafes, galleries and restaurants. A walk up to the Centre of NZ is a highlight. The Nelson Lakes are an hour away, with beautiful all year-round activities. We are a family of 4 living rurally after years living in big cities. We enjoy outdoor activities and being close to the beach, rivers and cycling tracks. We have chickens and occasional onsite sheep. While we live on the property, the cottage is separate from the main house and there is plenty of space for everyone to relax and enjoy. We chose this property because of its outstanding beauty. Close to all amenities and activities, it combines the best of being a working rural property and the perfect place to live / stay. Our cellar door is now a popular destination for both tourists and locals alike. Oh, and the night sky is amazing! Sliding doors separate the bathroom from bedroom and kitchen. Just a 10 minute drive to the beautiful beach of Kaiteriteri. Just a 15 minute drive to Marahau - the gateway to the Abel Tasman National Park. Electric heater available. Cottage is fully insulated. All towels and bedding provided. Washing machine and washing powder and pegs available in bathroom. Fresh towels for all guests provided. Including hand towels. Beach towels available on request. Open plan living room containing sofa, bookshelf and modern TV and DVD player. Plunger coffee and tea available. All dishes and cooking utensils included. Open plan fully functional kitchen with modern appliances. Bar height table and up to 4 bar stools create either a 'cool' eating space or additional bench space. Bookshelf with a selection of books available to read during your stay. Outside deck with table and chairs provided. The view of the garden and the walk to the sea are lovely. Great place for a rest after a long drive. Great wifi connection. Lovely spot! If you are looking for peace and quiet in a rural location on a working vineyard, this is the place for you. The hostess, Amber, has a well organised Bach with everything you need for a comfortable stay. Only wish we had stayed longer to explore the numerous delightful locations and attractions in the area. The place is really nice! Everything that we need during our stay was there. The bed and the sofa bed were really comfy and we didn't encountered any problem with the internet. Kitchen utensils are complete so all you need to do is to bring the ingredients to cook for your meal. We also had free wine tasting. And we've tried their products. We also had the chance to explore their area before we went home. It was a memorable place for us! Quiet, clean and tastefully decorated. Had everything we needed. Great hosts and lodging . Great hosts and lodging ... highly recommend!! 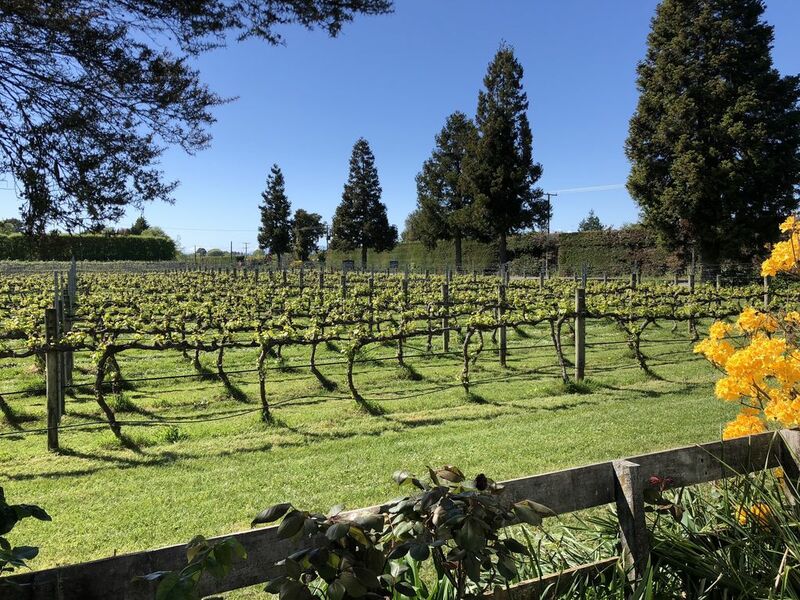 Set in 25 acres of rural land, surrounded by lush green mountains and rivers, the cottage at Riwaka River Estate is set on a working vineyard, hop garden and olive grove. A short drive away are the beautiful beaches of Kaiteriteri, Marahau and the Abel Tasman National Park. While you are here, we recommend a visit to the Resurgence - the source of our local river.